IBM has made Watson portable across any cloud as well as on-premise enterprise infrastructure. In opening Watson beyond its own cloud, IBM said its goal is to provide businesses with a simpler, faster way to build, deploy and run AI models and applications across any cloud. Introducing the ability to run IBM Watson services, including Watson Assistant and Watson OpenScale, on any cloud. Through their integration with IBM Cloud Private for Data (ICP for Data), Watson and Watson OpenScale can now be run any environment – on premises, or on any private, public or hybrid-multicloud – enabling businesses to apply AI to data wherever it is hosted. Businesses will be able to infuse AI into their apps, regardless of where they reside. The flexibility this affords can remove one of the major obstacles to scaling AI, since businesses can now leave data in secure or preferred environments and take Watson to that data. The announcements leverage a series of new Watson microservices built for ICP for Data that are based on Kubernetes, enabling these new Watson microservices to be run on IBM Cloud, and other public, hybrid or multi-cloud environments. Vendor revenue from sales of IT infrastructure products (server, enterprise storage, and Ethernet switch) for cloud environments, including public and private cloud, grew 47.2% year over year in the third quarter of 2018 (3Q18), reaching $16.8 billion, according to the International Data Corporation (IDC) Worldwide Quarterly Cloud IT Infrastructure Tracker. IDC also raised its forecast for total spending (vendor revenue plus channel mark-up) on cloud IT infrastructure in 2018 to $65.2 billion with year-over-year growth of 37.2%. 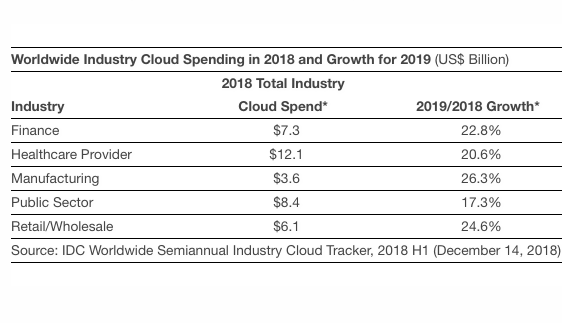 Five large industry groups, including healthcare, public sector, finance, retail/wholesale, and manufacturing, are expected to spend a total of $37.5 billion on industry cloud solutions in 2018, according to the Worldwide Semiannual Industry Cloud Tracker from International Data Corporation (IDC). The report forecasts the overall market to reach $45.4 billion in 2019. "IDC's latest forecast shows that industry cloud growth rates will continue to accelerate over the next three years, which is very unusual for multi-billion-dollar markets. This growth is being driven by rapidly-digitizing industries like healthcare, financial services, and manufacturing, where industry clouds are becoming the cornerstones for next-generation growth and innovation strategies," said Frank Gens, senior vice president & chief analyst at IDC. the U.S. will make up close to three-quarters of the overall market in 2018. Japan and China expected to grow the most year over year at 54% and 47% respectively. Other regions will also outperform their 2018 growth rates. Relative to all other regions, Japan can be considered a late adopter to industry cloud deploymen but will pass the $1 billion mark by 2022. China will pass the $1 billion mark by 2022. 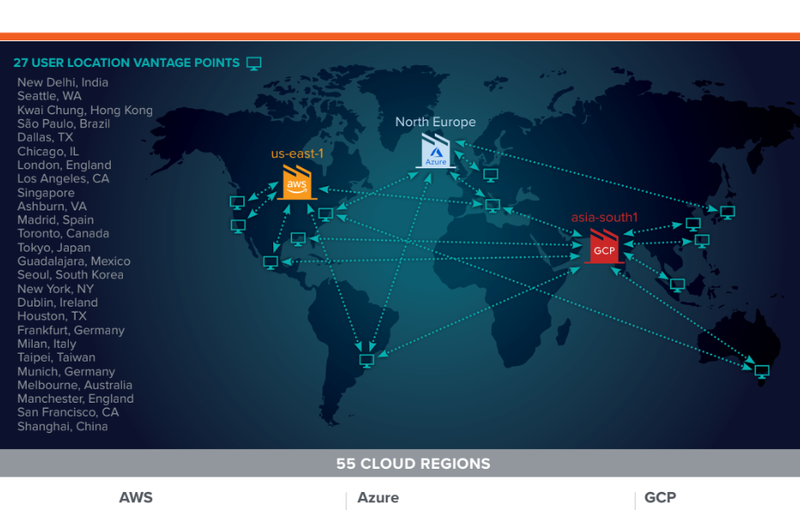 Microsoft Azure announced the expansion of Availability Zones into two additional regions, North Europe and West US 2. The company also announced an expanded list of zone-redundant services including Azure SQL Database, Service Bus, Event Hubs, Application Gateway, VPN Gateway, and ExpressRoute. Azure offers a 99.99 percent uptime SLA when virtual machines are running in two or more Availability Zones in the same region. Microsoft said this expanded coverage enables customers operating in the Europe and Western United States to build and run applications that require low-latency synchronous replication with protection from datacenter-level failures. With the combination of Availability Zones and region pairs, customers can create a comprehensive business continuity strategy with data residency in their geography of choice. In a keynote address at Oracle OpenWorld in San Francisco, Larry Ellison introduced Oracle's second generation cloud architecture featuring "Star Wars cyber defenses - an impenetrable force field with autonomous robots for finding threats and killing them." Current generation public clouds, use commodity servers built with standard silicon. A common base of cloud control code is used to manage multiple clients on same bare metal machine. The shared CPU, memory and storage introduce security risks for enterprises sharing these resources. In contrast, Ellison said the Oracle Gen 2 Cloud will not have cloud control software on each server. Instead, Oracle will use a separate network of dedicated cloud control computers to provide full isolation of customer data and separation of its control plane. Design goals for the Oracle Cloud 2 also focus on automation for the easy migration of workloads from on-prem resources, including via Kubernetes. 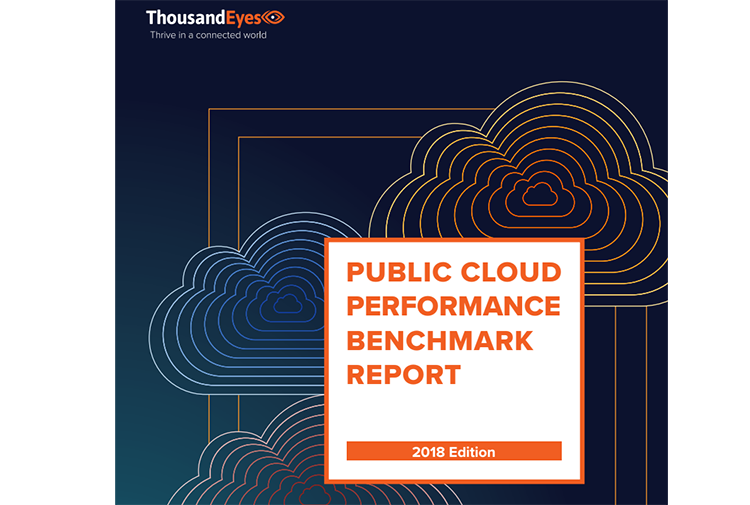 Ellison said that unlike AWS, Oracle will not significantly mark up interconnect bandwidth costs it obtains from telecom carriers for either ingress or egress from its public cloud. On pricing and performance, Ellison affirmed that Oracle will offer a better deal than AWS. In terms of performance, Oracle will see gains from using RDMA cluster networking. Oracle Gen 2 public cloud infrastructure is now ready for service, including its government cloud. In 2019, Oracle will also offer the option of having Oracle Gen 2 Cloud infrastructure deployed directly in the data centers of its largest enterprise customers. Ellison also stated that the most important component of this new cloud infrastructure is the Oracle Autonomous Database, which was introduced at last year's event. Zayo announced that a global cloud provider customer has selected it to expand its long-haul dark fiber network and to upgrade optical wavelength capacity across the U.S. Zayo did not disclose the name of the cloud company but said the plan represents an expansion of its existing relationship. The dark fiber solutions include leasing of multiple long-haul dark fiber routes, including fully redundant paths to meet growing diversity requirements. The customer also selected Zayo to upgrade existing wavelength routes from 10G to 100G in order to significantly increase capacity. 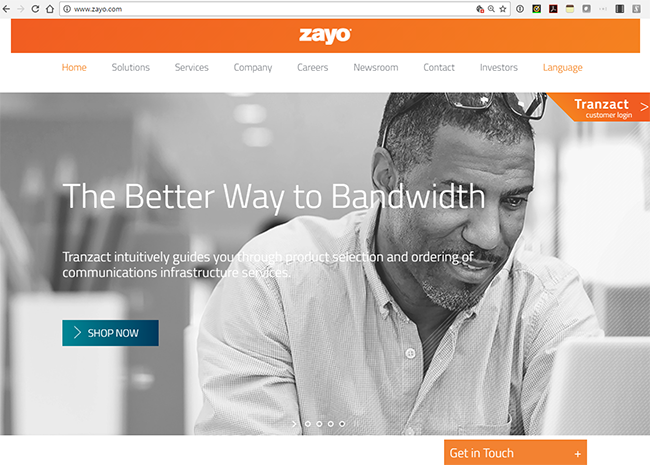 Zayo will also invest in additional metro network to connect to the provider’s data centers. In aggregate, the second calendar quarter commitments represent Zayo’s largest sales quarter with the long-standing customer. Microsoft reported revenue of $30.1 billion for its fourth fiscal quarter ended June 30, 2018, up 17% yoy. Operating income was $10.4 billion, up 35% yoy. GAAP net income was $8.9 billion and non-GAAP income was $8.8 billion. Microsoft announced the public preview release of Azure Service Fabric, which is its new distributed systems platform for managing scalable microservices and container-based applications for Windows and Linux. 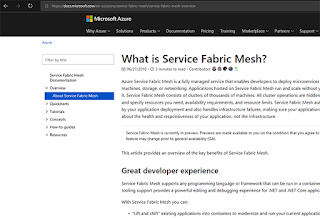 Microsoft describes Service Fabric as a foundational technology for its core Azure infrastructure, as well as other Microsoft cloud services such as Skype for Business, Azure Cosmos DB, Azure SQL Database, Dynamics 365, and many more. 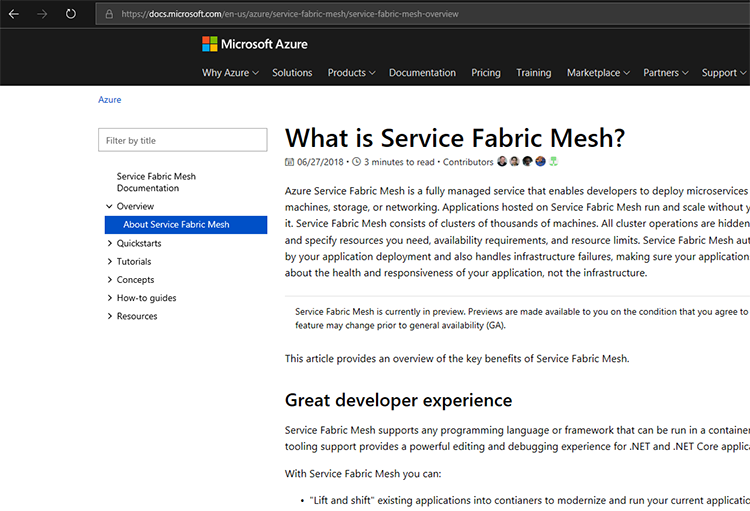 Azure Service Fabric Mesh will be a fully-managed service that enables developers to deploy and operate containerized applications without having to manage VMs, storage or networking configuration, while keeping the enterprise-grade reliability, scalability, and mission-critical performance of Service Fabric. Microsoft announced that its Azure Kubernetes Service (AKS) is now generally available in ten regions across three continents. Microsoft expects to add ten more regions in the coming months. The new Kubernetes service features an Azure-hosted control plane, automated upgrades, self-healing, easy scaling, and a simple user experience for both developers and cluster operators. Users are able to control access to their Kubernetes cluster with Azure Active Directory accounts and user groups. A key attribute of AKS is operational visibility into the managed Kubernetes environment. Control plane telemetry, log aggregation, and container health are monitored via the Azure portal. 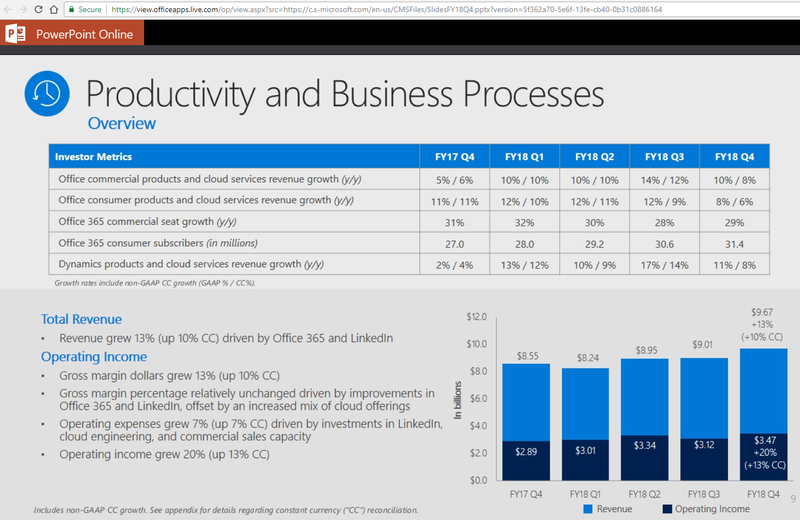 Microsoft also announced five new regions including Australia East, UK South, West US, West US 2, and North Europe. CenturyLink is launching a dedicated and private access service to Oracle Cloud. 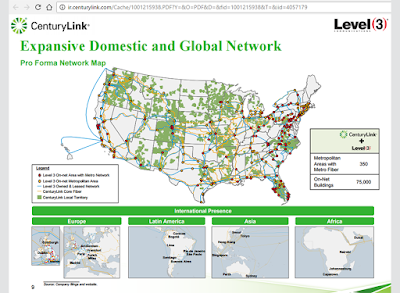 The CenturyLink Cloud Connect Solutions and Oracle’s FastConnect service will be delivered via both Wavelengths and MEF 2.0-certified Carrier Ethernet services. Orange Business Services has agreed to acquire Basefarm Holding AS, a major player in cloud infrastructure and critical application services in Europe, for EUR 350 million. Basefarm, which recorded revenues of over EUR 100 million in 2017, has an operational presence in several European countries, particularly in Norway, Sweden, the Netherlands, Austria and in Germany. Orange Business Services said the acquisition of Basefarm represents an advancement of its development strategy, complementing its existing catalogue of offers. The addition of Basefarm will also complete the geographical reach of Orange’s services, enabling it to become a leading player in Europe. The Basefarm group consists of four companies; Basefarm AS (Norway), Basefarm BV (Netherlands), Basefarm AB (Sweden) and The unbelievable Machine Company Gmbh (Germany and Austria). ABRY Partners holds a 90% stake in Basefarm. The company was founded in 2000, is based in Oslo, and is headed by Fredrik Olhsen. Microsoft is introducing two new services that significantly increase the reach and security of its cloud service: Azure Virtual WAN (wide-area network) and Azure Firewall. 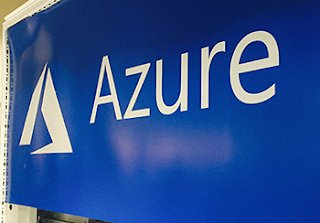 Azure Virtual WAN is a networking service providing optimized and automated branch to branch connectivity for connecting to and through Azure using a distributed connectivity model. It provides mechanisms to connect traditional customer routers on-premises as well as an expanding ecosystem of new Software-Defined WAN (SD-WAN) systems from Microsoft partners. Microsoft said its Virtual WAN allows customers to seamlessly connect their branches to each other and Azure using last mile Internet. It also enables customers to construct a hub and spoke network in Azure to more easily route traffic to virtual appliances such as firewalls and Azure network security services. Microsoft's current Virtual WAN partners include Citrix and Riverbed. Azure Firewall is a cloud-native network security service that protects Azure Virtual Network resources. It is a fully stateful firewall as a service with built-in high availability and unrestricted cloud scalability. Customers can centrally create, enforce, and log application and network connectivity policies, spanning Fully Qualified Domain Names (FQDNs), IP Addresses, ports and protocols across subscriptions and virtual networks. Azure Firewall policies can be fully integrated with customers’ DevOps model while enabling them to manage security risks and achieve compliance requirements for managing resource access and protection in the cloud. Microsoft has also updated its Azure Data Box, which is its data storage appliance for physically transferring large data sets from a customer location to the Azure cloud. The Azure Data Box will now be offered in Europe and the United Kingdom. A new Azure Data Box is an SSD-disk based option with up to five 8TB drives, totaling 40TB, for a recurring or one-time data migration. This week Microsoft is hosting its Inspire partner conference in Las Vegas. What is Azure Virtual WAN (preview)? Oasis Labs, a start-up based in Berkeley, California, is reported to have raised $45 million in a private token sale for its "privacy-first public cloud platform based on blockchain. The idea is to ensure that privacy is built into each layer of the stack, from the application all the way down to hardware. The system promises codified and self-enforceable privacy protection without relying on any central party. Oasis Labs is headed by Dr. Dawn Song (CEO) who is Professor of Computer Science at University of California, Berkeley, and a MacArthur Fellow.